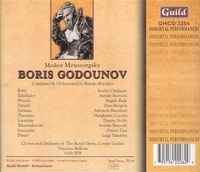 "Feodor Chaliapin, the first great Boris interpreter and one who, miraculously, is caught in relatively well recorded excerpts live at the Royal Opera in 1928....The voice has a weight and force seldom equalled but with a baritonal vocal thread that allows his soto voce to make as powerful an impression as his full roar. He needs fewer of the histrionic effects than those who came after him, if only because he projects words with a force that comes with long-distilled dramatic truth." "Chaliapin was considered to be the finest Boris for three decades. Although he didn't sing at the premiere of the Korsakov version in 1896 at St. Petersburg, he did sing first performances in Moscow, Paris, Milan and London. We are fortunate it was decided to record the 4 July, 1928 Covent Garden performance which presents a rather strange situation - Boris was sung in Italian, but Chaliapin sang in Russian. Technical problems made a number of the 78 rpm sides unusable, but what was usable has been issued many times on various labels. Richard Caniell, obviously a great fan of Chaliapin, produced the Guild CD which contains all of the previously issued excerpts from the live Covent Garden performance. In an attempt to include more of that performance, Canelli has 'cut and pasted' from the live performance - including several restored damaged sections - and Chaliapin commercial recordings. He also has interpolated two excerpts from a performance by another fine Boris, Nicola Moscona, to provide continuity. A 20-page booklet focuses on Chaliapin and details of performance restoration....this is a valuable CD."